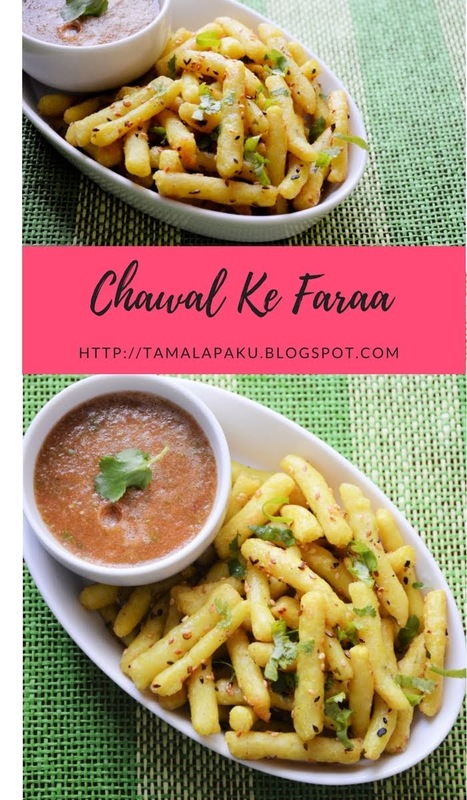 When I was searching for breakfast recipes in different parts of India, I came across various articles which talk about these 'Faraa' as a favored breakfast dish of Chattisgarh and also a good usage of leftover rice. Mash the cooked rice (either with a potato masher or pulse it in a mixer). In a mixing bowl, transfer the mashed rice, add in rice flour, salt, green chili paste, cumin powder and turmeric. Mix well. Gradually add warm water to the flour mixture and knead into a soft dough. Cover and set aside for a few minutes. With greased palms, pinch lime sized portions of the dough and make 1 centimeter thick rope. Slice them into 2 inch pieces and arrange on greased plates. Arrange the steamed plates in a steamer and steam for 15 minutes. (I used Dhokla plates for steaming). In a heated pan, add oil and the rest of the seasoning ingredients. After the mustard seeds pop, add in some green chili paste and transfer the steamed dumplings into the seasoning. Saute the dumplings for about 5-7 minutes until they are golden brown. Remove from heat, garnish with chopped coriander leaves and serve warm with a spicy chutney. wow such perfectly make delicious fara there :) looks so delicious, this is something would love to have for a snack as well .. looks absolutely crispy and flavorful..Wonderful breakfast recipe from Chhattisgarh.. I would love to enjoy it with that spicy chutney!! what chutney is it ?? Wow the chawal ka fara is one interesting breakfast recipe from Chattisgarh. We used to make something similar but sun-dried and later on would fry those. Such simple yet innovative breakfast. Wow! this is such a nice recipe to use leftover rice other than making pakoras and flavored rice varieties. It looks perfect Harini! Awesome share harnini ,I first thought them as french fries.. So perfect and crisp..This is sure a to do recipe..
WHat a wonderful way to finish leftover rice dish, such a delicious and healthy dumplings to have anytime without any fuss. Interesting recipe with cooked rice. A new one for me and thanks for the share. Love to learn about these new recipes. Great pick Harini. That's an interesting recipe and it reminds me of kozhukattai . Adding cooked rice is a nice twist to the recipe and it makes a healthy snack for tea time. I have never heard of this dish before and this is a great idea to use up leftover rice to make a snack. Love the recipe and this would definitely keep my kids filled up as a after school snack. Wow, what an interesting dish. I thought they were French fries the first time I saw them. I would never guess that they are made with leftover rice. Good pick Harini. These faraa looks so much like ammini kolukattai, but the shape differs. The addition of cooked rice must give it a different taste too. These must be quite addictive and they look super tempting..
Wow harini, what a find! Loving it!! Bookmarking right away, i try to make mixed rice or pakoras with leftover rice, this steamed dumplings are such a wonderful and healthy makeover!! The first time I came across faraa was when we did the state wise recipes for shhh cooking secretly group. Its such a healthy and filling dish. You have shaped the faraas so well. Chawal ke farre is one of popular snack in chattisgarh... Last time in street food event i tried this.. your recipe looks so tempting. Harini love how you have clicked these pictures, looks amazing yaar!..lovely light effect, I must say you use the same setup and composition for all your pictures..This dish has ever been on my todo list, will surely attempt it soon! This makes a great snack as well and guilt free too. BTW what chutney did you serve it with?